Headaches: How Often is Too Often? Everyone experiences headaches now and again, but if you find yourself dealing with headaches several times a month, it may be an indication of a Temporomandibular Disorder (TMD) also known as TMJ. TMJ is a condition that affects your Temporomandibular Joints (TMJ) or jaw joints. Improper alignment of the jaw joints and teeth can cause stress, leading to headaches and other facial pain. Problems may also affect the muscles in your face that help you speak, chew and open and close your mouth. 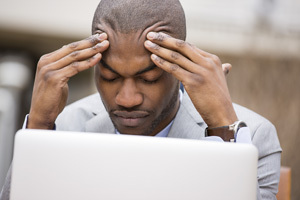 What makes a TMJ-related headache different from a common tension headache? Facial tenderness and pain in the area in front of your ear (sometimes mistaken for an earache). What lifestyle changes can I make to relieve symptoms? Avoiding chewing gum, eating softer foods, reducing stress, and jaw massages and exercises (as suggested by your dentist), and taking over-the-counter pain relievers can help alleviate or reduce TMJ headaches, but it’s important to also involve your dentist in properly diagnosing your condition. Formal treatment may be necessary to effectively and permanently relieve frequent headaches, stiffness and pain associated with TMJ. How is TMJ treated at Morgan & Haupt Dentistry? One of the simplest and most effective ways for treating TMJ headaches is through custom made mouth guards (note: in most cases, store-bought night guards are not sufficient and can actually worsen the problem). Typically worn at night, these are used to adjust the alignment of the jaw. The guard covers the teeth and prevents clenching and grinding, alleviating the morning headache patients experience from TMJ. If your TMJ headaches are caused by malocclusion, we may recommend bite correction therapy. This includes reshaping the teeth, so they make proper contact through straightening procedures such as Invisalign®.